The Mechanicsburg real estate market is thriving with high demand and low inventory pushing up residential prices. On the commercial side, retail is strong, but it’s the industrial market that’s hot. 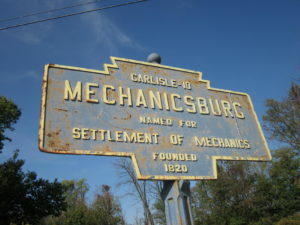 Mechanicsburg spans about 550 square miles in Cumberland county. Its center, the Borough of Mechanicsburg, is located 8 miles south and west of Harrisburg, the state capital. In addition to hosting the Pennsylvania Turnpike, Mechanicsburg also connects to Interstates 81 and 83, known as the Capital Beltway, and state routes 11 and 15 making it accessible to all major metropolitan areas of the East Coast. It’s about a 30 minute drive to Hershey and within two hours of Philadelphia, PA; Baltimore, MD; and Washington, D.C. In addition to the Borough, Mechanicsburg encompasses multiple municipalities including Hampden Township, Lower Allen Township, Monroe Township, Silver Spring Township, and Upper Allen Township, as well as parts of East Pennsboro Township, Fairview Township and Managhan Township. With its strong school district, historic buildings, restaurants, and mom and pop shops, Mechanicsburg Borough is exploring its potential to meet the growing demand for walkable cities. Leaders from the Downtown Mechanicsburg Partnership are in the early phases of organizing a capital campaign aimed at redeveloping the downtown as a destination for residents and tourists. Development of the borough’s last large land tract is also underway. The 200 acre site at the south end of Market Street will include a mix of multi-family, residential, and commercial properties and is garnering significant interest. With the desirable Cumberland Valley and West Shore school districts serving the rest of Mechanicsburg, the residential market is exploding. On the heels of the highly successful Walden development in Silver Spring Township, Arcona in Allen Township is the next live, work, play model for the area. The community has several commercial buildings that are already under roof and rented to serve a growing neighborhood of single family and townhome owners. In addition, ground is breaking for a 200+ apartment community within the neighborhood. Additional commercial development in that vicinity will be buoyed by the installation of a traffic round-about planned at the convergence of Rossmoyne and Lisburn roads. Though the national retail scene is looking glum, the bustling shopping corridor of the Carlisle Pike (Route 11) stretching from Hampden Township into Silver Spring Township, which includes big box and other retail stores and a broad selection of restaurants, indicates otherwise. “The quick turn-around in 2017 of prime property vacated by Kmart along the Pike and recent development of an additional strip mall on that route point to Mechanicsburg’s strength in the retail market,” says Heller. And while there are pockets of vacant offices throughout Mechanicsburg, demand for warehousing and distribution centers is strong. Hampden Township is already home to a long standing 806-acre naval supply depot, and other industries are taking a look at Mechanicsburg because of its accessibility. Chuck Heller is an associate broker with Landmark Commercial Realty, Inc. His nearly two decades in commercial realty include complex sales and lease transactions, retail properties, manufactured home communities and land development in the Harrisburg region. Looking at each day as an opportunity to learn and meet someone new, Chuck has proven himself a leader in the multi-family market with his quarterly research and reports on changing market trends. His dedication, attention to detail, and proactive mindset has sustained many strong relationships between himself and prominent property owners in South Central Pennsylvania.